Hellas Planitia is a plain located within the huge, roughly circular impact basin Hellas[a] located in the southern hemisphere of the planet Mars. Hellas is the third or fourth largest impact crater and the largest visible impact crater known in the Solar System. The basin floor is about 7,152 m (23,465 ft) deep, 3,000 m (9,800 ft) deeper than the Moon's South Pole-Aitken basin, and extends about 2,300 km (1,400 mi) east to west. It is centered at 42°24′S 70°30′E﻿ / ﻿42.4°S 70.5°E﻿ / -42.4; 70.5. Hellas Planitia is in the Hellas quadrangle and the Noachis quadrangle. Topographic map of Hellas Planitia and its surroundings in the southern uplands, from the MOLA instrument of Mars Global Surveyor. The crater depth is 7,152 m (23,465 ft) below the standard topographic datum of Mars. With a diameter of about 2,300 km (1,400 mi), it is the largest unambiguous impact structure on the planet; the obscured Utopia Planitia is slightly larger. (The Borealis Basin, if it proves to be an impact crater, is considerably larger.) Hellas Planitia is thought to have been formed during the Late Heavy Bombardment period of the Solar System, approximately 4.1 to 3.8 billion years ago, when a large asteroid hit the surface. The altitude difference between the rim and the bottom is 9,000 m (30,000 ft). The depth of the crater (7,152 m (23,465 ft) ( 7,000 m (23,000 ft)) below the standard topographic datum of Mars) explains the atmospheric pressure at the bottom: 12.4 mbar (0.012 bar) during the northern summer . This is 103% higher than the pressure at the topographical datum (610 Pa, or 6.1 mbar or 0.09 psi) and above the triple point of water, suggesting that the liquid phase could be present under certain conditions of temperature, pressure, and dissolved salt content. It has been theorized that a combination of glacial action and explosive boiling may be responsible for gully features in the crater. Some of the low elevation outflow channels extend into Hellas from the volcanic Hadriacus Mons complex to the northeast, two of which Mars Orbiter Camera images show contain gullies: Dao Vallis and Reull Vallis. These gullies are also low enough for liquid water to be transient around Martian noon, if the temperature were to rise above 0 Celsius. Hellas Planitia is antipodal to Alba Patera. It and the somewhat smaller Isidis Planitia together are roughly antipodal to the Tharsis Bulge, with its enormous shield volcanoes, while Argyre Planitia is roughly antipodal to Elysium, the other major uplifted region of shield volcanoes on Mars. Whether the shield volcanoes were caused by antipodal impacts like that which produced Hellas, or if it is mere coincidence, is unknown. Apparent viscous flow features on the floor of Hellas, as seen by HiRISE. Twisted terrain in Hellas Planitia (actually located in Noachis quadrangle). Twisted bands on the floor of Hellas Planitia, as seen by HiRISE under HiWish program These twisted bands are also called "taffy pull" terrain. Due to its size and its light coloring, which contrasts with the rest of the planet, Hellas Planitia was one of the first Martian features discovered from Earth by telescope. Before Giovanni Schiaparelli gave it the name Hellas (which in Greek means 'Greece'), it was known as 'Lockyer Land', having been named by Richard Anthony Proctor in 1867 in honor of Sir Joseph Norman Lockyer, an English astronomer who, using a 16 cm (6.3 in) refractor, produced "the first really truthful representation of the planet" (in the estimation of E. M. Antoniadi). Radar images by the Mars Reconnaissance Orbiter (MRO) spacecraft's SHARAD radar sounder suggest that features called lobate debris aprons in three craters in the eastern region of Hellas Planitia are actually glaciers of water ice lying buried beneath layers of dirt and rock. 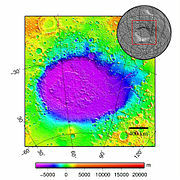 The buried ice in these craters as measured by SHARAD is about 250 m (820 ft) thick on the upper crater and about 300 m (980 ft) and 450 m (1,480 ft) on the middle and lower levels respectively. Scientists believe that snow and ice accumulated on higher topography, flowed downhill, and is now protected from sublimation by a layer of rock debris and dust. Furrows and ridges on the surface were caused by deforming ice. Also, the shapes of many features in Hellas Planitia and other parts of Mars are strongly suggestive of glaciers, as the surface looks as if movement has taken place. These relatively flat-lying "cells" appear to have concentric layers or bands, similar to a honeycomb. This "honeycomb" terrain was first discovered in the northwestern part of Hellas. The geologic process responsible for creating these features remains unresolved. Some calculations indicate that this formation may have been caused by ice moving up through the ground in this region. The ice layer would have been between 100 m and 1 km thick. When one substance moves up through another denser substance, it is called a diapir. So, it seems that large masses of ice have pushed up layers of rock into domes that were eroded. After erosion removed the top of the layered domes, circular features remained. Close view of honeycomb terrain, as seen by HiRISE under HiWish program This enlargement shows material breaking up into blocks. Arrow indicates a cube-shaped block. Layers in depression in crater, as seen by HiRISE under HiWish program A special type of sand ripple called Transverse aeolian ridges, TAR's are visible and labeled. Hellas Basin is a primary location in the 2017 video game Destiny 2. The location is part of the game's Warmind downloadable content. It is also featured as a main location in the 2016 Bethesda video game reboot Doom. The name is used as one of the signs of emotional disturbance in the protagonist in the short story "The Seat of Learning" in the anthology The Mountain of Long Eyes. ^ Officially, Hellas is an albedo feature. ^ "Hellas". Gazetteer of Planetary Nomenclature. USGS Astrogeology Science Center. Retrieved 2015-03-10. ^ a b "Hellas Planitia". Gazetteer of Planetary Nomenclature. USGS Astrogeology Science Center. Retrieved 2015-03-10. ^ Schultz, Richard A.; Frey, Herbert V. (1990). "A new survey of multi-ring impact basins on Mars". Journal of Geophysical Research. 95: 14175. Bibcode:1990JGR....9514175S. doi:10.1029/JB095iB09p14175. ^ Acuña, M. H.; et al. (1999). "Global Distribution of Crustal Magnetization Discovered by the Mars Global Surveyor MAG/ER Experiment". Science. 284 (5415): 790–793. Bibcode:1999Sci...284..790A. doi:10.1126/science.284.5415.790. PMID 10221908. ^ "...the maximum surface pressure in the baseline simulation is only 12.4 mbar. This occurs in the bottom of the Hellas basin during northern summer", JOURNAL OF GEOPHYSICAL RESEARCH, VOL. 106, NO. El0, PAGES 23,317-23,326, OCTOBER 25, 2001, On the possibility of liquid water on present-day Mars, Robert M. Haberle, Christopher P. McKay, James Schaeffer, Nathalie A. Cabrol, Edmon A. Grin, Aaron P. Zent, and Richard Quinn. ^ Peterson, J. E. (March 1978). "Antipodal Effects of Major Basin-Forming Impacts on Mars". Lunar and Planetary Science. IX: 885–886. Bibcode:1978LPI.....9..885P. ^ Williams, D. A.; Greeley, R. (August 1994). "Assessment of Antipodal-Impact Terrains on Mars". Icarus. 110 (2): 196–202. Bibcode:1994Icar..110..196W. doi:10.1006/icar.1994.1116. Retrieved 2012-07-04. ^ William Sheehan. "The Planet Mars: A History of Observation and Discovery". Retrieved 2007-08-20. ^ NASA. "PIA11433: Three Craters". Retrieved 2008-11-24. ^ a b Bernhardt, H.; et al. (2016). "The honeycomb terrain on the Hellas basin floor, mars: a case for salt or ice diapirism: hellas honeycombs as salt/ice diapirs". J. Geophys. Res. 121 (4): 714–738. Bibcode:2016JGRE..121..714B. doi:10.1002/2016je005007. ^ "HiRISE | to Great Depths (ESP_049330_1425)". ^ Weiss, D.; Head, J. (2017). "Salt or ice diapirism origin for the honeycomb terrain in Hellas basin, Mars? : Implications for the early martian climate". Icarus. 284: 249–263. Bibcode:2017Icar..284..249W. doi:10.1016/j.icarus.2016.11.016. Antoniadi, E.M. The Hourglass Sea on Mars, Knowledge, July 1, 1897, pp. 169–172. Wikimedia Commons has media related to Hellas Planitia.